Brewed with a bit of maple syrup to add an interesting extra dimension, this nut brown ale pours a rich, deep hue that’s actually quite red when held to the light. This is an attractive beer – we’re off to a good start. On the nose, the malts are prominent, with a moderate bready character and big caramelized malt notes that lend a distinctly sweet impression. Look for a mild toasty and nutty quality, along with a subtle but distinct hint of maple and some spicy, grassy hops overlaying it all. Quite round and satisfying on the palate, this brew hit us moderately sweet upfront, but the hops add a drying, balancing bitterness in the finish where it lingers with a nutty character. The toasty bread and caramel notes from the nose come through in the flavor too, along with that subtle maple note, some hints of citrus, and perhaps just a touch of dark fruity esters too. The brewery says this is their most popular bottled beer, and it’s not hard to see why. Try this one with French onion soup or a moderately spiced jambalaya. Cheers! The Tommyknocker Brewery was founded as a brewpub in 1994 (which coincidentally is also the year we started the Microbrewed Beer of the Month Club) at an elevation of about 7500 feet in the old mining town of Idaho Springs, CO. The town, which is about a 40 mile drive west of downtown Denver, was founded in 1859 during the Colorado gold rush, and it is this mining history that the brewery latched on to when crafting their brand identity. Tommyknockers are mythical creatures, not unlike leprechauns, that are purported to live underground and signal to miners when a collapse is imminent by making knocking sounds in the rock. They also get blamed sometimes when tools malfunction or go missing. We can’t verify if tommyknockers are responsible for swiping miners’ tools when they aren’t looking, but we can tell you that they do know how to make some good beers in their spare time. 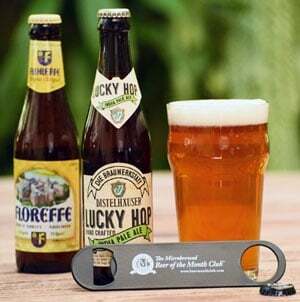 In fact, they’ve been collecting awards since 1995 from both the Great American Beer Festival and the World Beer Cup. If you’re ever traveling through the Rockies on I-70 near Denver, it’s well-worth stopping at the brewpub for a buffalo burger and a fresh brew on draft. The brewery produces a very broad range of year-round and seasonal beers (as many as 17 by our count) as well as a line of sodas including orange, strawberry, and almond cremes as well as root beer. 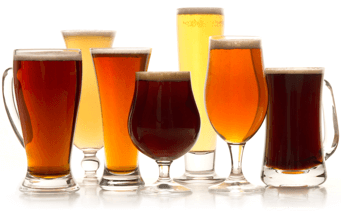 We'll let you discover those on your own and stick to what we do best: Beer! For more information about the brewery and brewpub, call (303) 567-2688 or check out their web site at www.tommyknocker.com.